Pick up at 8:00 in the morning at the Hotel or Riad where they are staying in Marrakech. 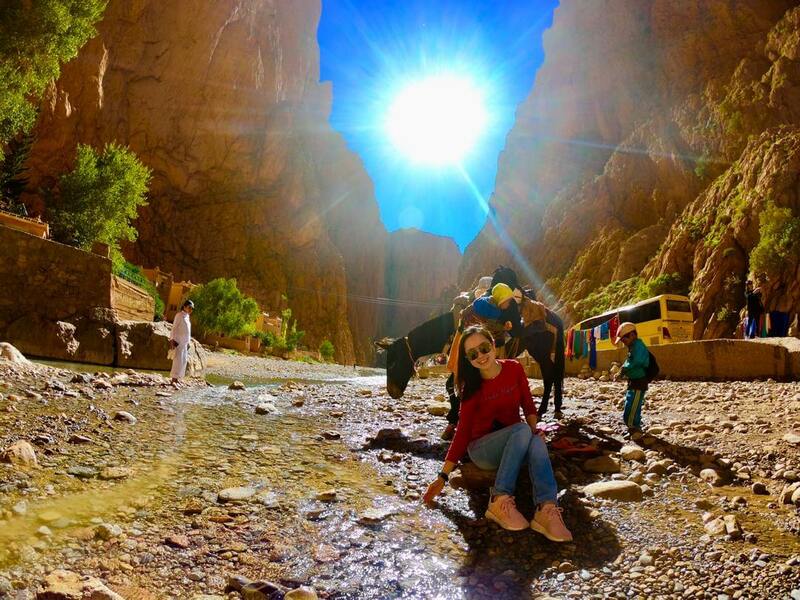 We will go to the High Atlas through the port of Tizi N'Tichka making some stops with panoramic views. We will make our way among numerous Berber nomadic peoples that inhabit the area. We will continue towards Ouarzazate. We will cross the Valle de las Rosas, to enter the Dades Valley, where the so-called "route of the thousand kasbahs" begins, we will go through the "fingers of monkeys", a rocky landscape known as "the brain of the Atlas". We will arrive at our destination, dinner and accommodation in the Dades Valley. After breakfast, we will visit the spectacular Garganatas del Dadès, enjoying the spectacular scenery that the road offers to them. We will return to head for a road dotted with Kasbah all different. We will arrive at one of the strong points of the South, The Todra Gorges. The channel of the Todra River has formed a gorge of vertical walls of enormous proportions, up to 200m of altitude, and of great beauty. It is a paradise for climbers and a unique place. Free lunch Then continue to the desert through the palm grove of Tafilalet and through Erfoud to reach the impressive dunes of Merzouga. Arrival at the hotel located at the foot of the dunes, where we will have a hospitality tea while we rest a little. Then you can walk through the fine sand of Erg Chebbi, relax and enjoy this impressive landscape. At night, you will savor a delicious Berber dish. Accommodation at the hotel. After a hearty Moroccan breakfast, we will board the 4x4 to get away from Merzouga and start our tour around the Erg Chebbi dunes, a desert region populated by sand. Among the numerous stops that await us, we will discover how and where the nomadic families of the area live, wild oases in the middle of nowhere, spectacular landscapes, small desert towns, palm groves ... Inevitable stop as we pass through the town of Khamlia, of people from Mali, who will make us enjoy a nice concert of gnawa music, while we taste a delicious tea. On the way back to the hotel, our dromedaries await us with which we will leave towards the foot of the Great Dune of the Erg Chebbi desert. During the walk, an hour and a half approximately, we can observe the beautiful sunset, the contrast of colors and enjoy the calm of the dunes. We will arrive at the camp. We will savor an authentic Berber dinner and enjoy the music of the drums. We will sleep in a nomadic tents in the heart of the desert under the spectacular immense sky full of stars. Draa Valley and its thousands of palm trees. Dinner and accommodation in Ouarzazate.